Now, the moment you have been waiting for all summer. Here are the fall banding dates. We will be taking a week off during the middle of the 6 week period to give the volunteers a break and to allow a few of us to possibly go visit another banding station in south Florida. I hope that you will all be able to come visit us at least one of the days this season! As per usual, the station is open from 8 am to noon each day. All are welcome! What did you do that was “for the birds” this summer? Like many of you I travelled out of the Sunshine State to visit family, naturalize/bird and see cool natural places. It is a chance to get away, gain perspective and just enjoy life. 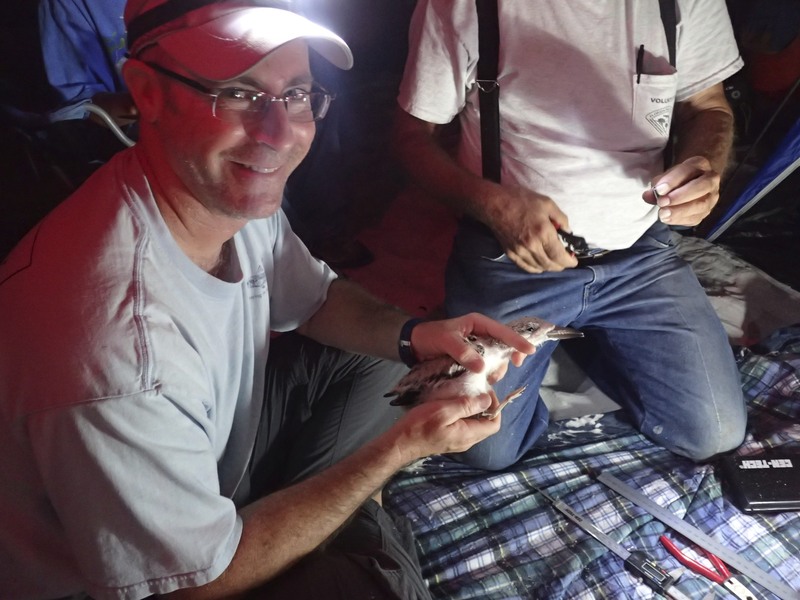 For me, one of the highlights of my summer had to be helping out with banding black skimmer chicks. Dr. Beth Forys, Eckerd College, was the lead researcher who lead the effort. We banded in early July on two local beaches: St. Petersburg Beach and Indian Rocks Beach. It required being on the beach at 4 am to enable the team to locate, capture, band and release the chicks before the sun came up. This was due to the heat and stress on the birds as well as to keep from attracting the inquisitive public. Each session was a learning experience and we got better each time. I think in all there are 30+ chicks banded with large plastic color bands. 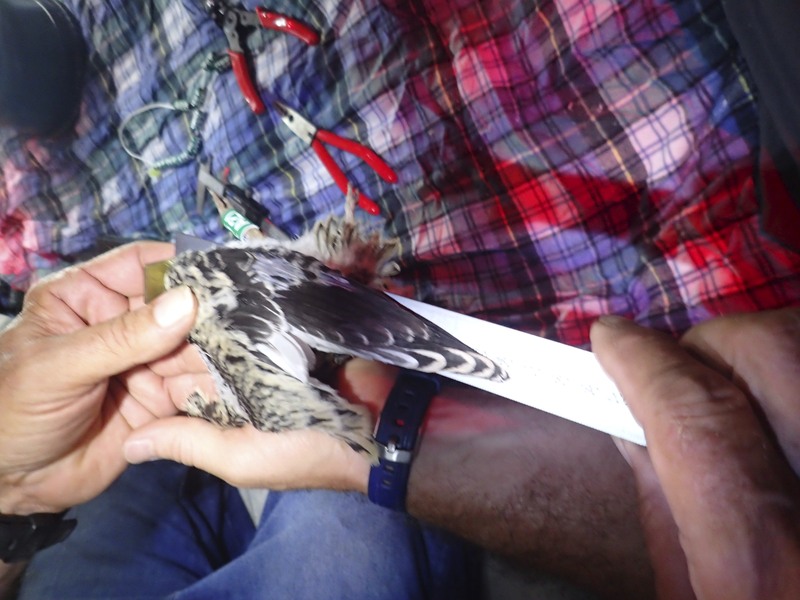 These will allow observers to identify individual birds without having to recapture them. 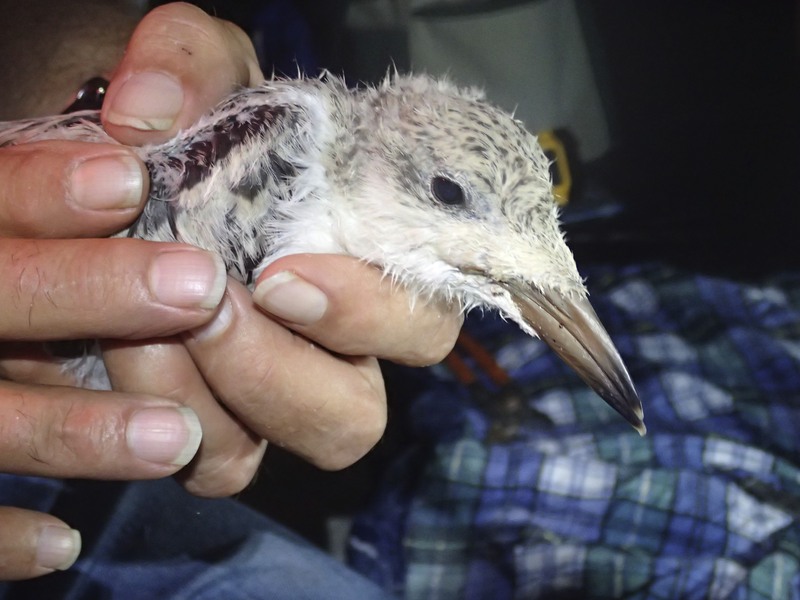 The primary objective of the study is to learn about the dispersal of the chicks throughout the area over time. It was a very cool experience that I hope to participate in next year. Measuring Black Skimmer chick wing chord.